In this photo released by the official website of the office of the Iranian Presidency, President Hassan Rouhani speaks during a ceremony marking "National Day of Nuclear Technology," in Tehran, Iran, April 9, 2019. Steve Herman contributed to this report from the White House; Carla Babb - from the Pentagon. "This unprecedented step, led by the Department of State, recognizes the reality that Iran is not only a State Sponsor of Terrorism, but that the IRGC actively participates in, finances, and promotes terrorism as a tool of statecraft,” President Donald Trump declared in a statement. “The IRGC is the Iranian government’s primary means of directing and implementing its global terrorist campaign." 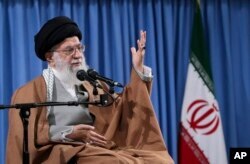 In this picture released by an official website of the office of the Iranian supreme leader, Ayatollah Ali Khamenei speaks at a meeting with a group of Revolutionary Guards and their families, in Tehran, Iran, April 9, 2019.